All-attitude, highly damped mounts for protection of equipment from vibration, shock during steady-state acceleration. 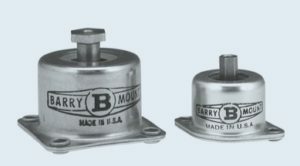 Barry B-Mounts provide shock and vibration isolation for avionic equipment in high performance aircraft. They feature low resonant transmissibility and isolate high frequency vibration without snubbing during high “g” maneuvers. Operating temperature range -85ºF to +250ºF (-65ºC to +120ºC). Meets strength, corrosion resistance and environmental requirements of MIL-E-5272, MIL-E-5400 and MIL-STD-810. TRANSMISSIBILITY AT RESONANCE 3.0 Max.